Only within can you find the answer. The Divine is what we call the macro, and we are the micro. The goal is to merge the two into one. That is the goal and the answer. This quote is paraphrased from Piers Moore Ede's All Kinds of Magic: A Quest For Meaning In A Material World. 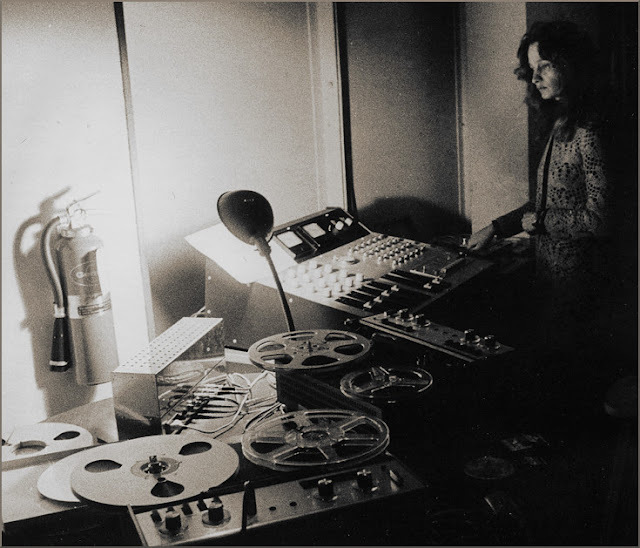 My photo shows Eliane Radique; as the sleeve note for the Imprec label CR release of her Triptych explains, after the premiere of Adnos I in San Francisco in 1974, a group of French students introduced Eliane Radigue to Tibetan Buddhism. When she returned to Paris, she began to explore this spirituality in depth, which slowed her musical production up until 1978. Triptych marks her return to composition, and draws its inspiration from "the spirit of the fundamental elements", water, air, fire, earth....Eliane Radigue likes to add that this has often been useful to her in her moments of research and transitions. Eliane Radique is one of many women musicians who are still shamefully overlooked. Much more work is needed to give them their rightful place in the musical pantheon. But advocacy based on the context and merit of their music and not based solely on their gender is needed to achieve this. A video portrait of Eliane Radique is below.